Slow, disjointed and disappointing on all fronts. The agonizing slow opening didn’t build high hopes despite Gugu Mbatha-Raw’s (Belle) best efforts. Drudging through some guff about blackouts and finding a new source of energy. The visuals effects were impressive enough BUT it took a good 20 minutes before anything interesting actually happened. We watched as the team of cliched characters argued and scrapped after two years of failing to deliver results. Bear McCreary’s score was wasted on this film BUT it lifted a seemingly bland and hum drum first act. However, one final test on the accelerator changed everything as the team were inadvertently teleported to another reality (One of vast nothingness apparently). Five minutes later, one ear piercing Godzilla like shriek and I was intrigued. BUT instead of getting some gargantuan alien super being, we had an amnesia-ridden Elizabeth Debicki (The Man From U.N.C.L.E) trapped in a wall. Okay, the mangled time lines and molecular restructuring had its moments as crew members fused into walls and rooms and parts of the ship moved around BUT it wasn’t enough. I was disappointed at how such a talented cast were given such unmemorable characters. I mean, come on! You had David Oyelowo (Selma) playing a tortured space captain that spent the majority of the film sobbing in his quarters and Ziyi Zhang (House of Flying Daggers) in one of the most unmemorable supporting roles I’ve seen. What a waste of an actress. Even when the inevitable body count rose, I felt nothing for them. It had so much promise BUT just didn’t amount to anything. It could have gone down the Event Horizon route, it didn’t. We could have had a demented take on 2001: A Space Odyssey, we didn’t. Daniel Bruhl (Good Bye Lenin!) and Aksel Hennie (Headhunters) were the only memorable characters. Well, that’s not entirely true. Only Chris O’Dowd (The IT Crowd) could get away with making one scene so ridiculous actually work. The arm! My God. Seriously? If someone’s (perfectly clean) severed arm crawled across the floor like Thing out of The Addams Family; I wouldn’t be standing there pointing. The best scene BUT also the worst as it established Paradox’s underlying problem. A lack of direction and tone. A chaotic mess. That laughable moment livened up an incredibly dull affair. Debicki was left to wallow on a bed and reminisce about memories of Hamilton (Mbatha-Raw) from another reality. Yawnnn . . . I was more interested in what Hamilton’s husband (Roger Davies) was doing back on Earth in the disjointed side story. It beat watching the crew go stir crazy and inevitably betray each other. Some things are better left unanswered. I think the Paradox team should have learned from the Alien franchise. 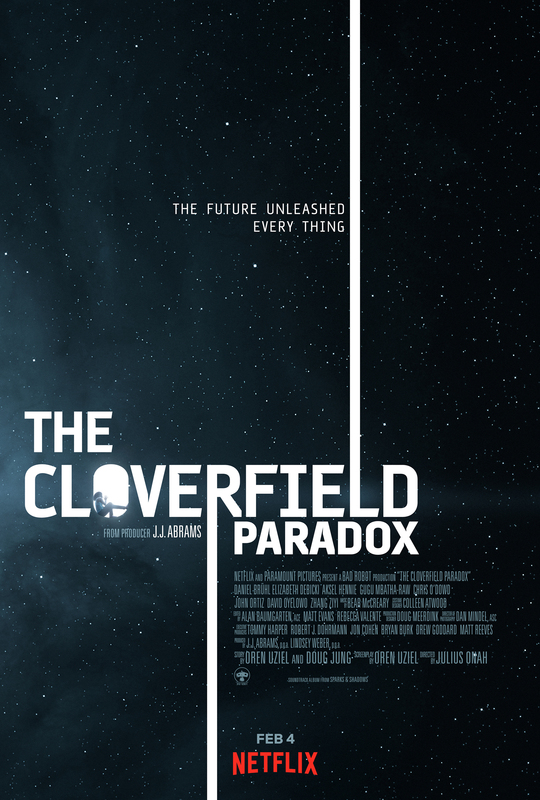 I can respect that it tried to be something different BUT apart from that final shot, I couldn’t even call this a Cloverfield film. It was tough NOT to make comparisons. At least 10 Cloverfield Lane gave some sort of indication that it fit in the same universe. And at least that was an absorbing thriller that made full use of its THREE protagonists. Where did Paradox even fit in the timeline? Before or after? Was their experiment the reason that giant creature hit the city in the first place? By the end, I didn’t care. Maybe I expected too much BUT it failed to deliver in tension, suspense and the tone was completely all over the place. It felt like the production company just nicked the Cloverfield title for click bait. Or maybe this film was teleported from another reality where the Cloverfield movies were dire efforts that went straight to Netflix? Maybe . . .